Sir Tim Rice’s latest musical, From Here to Eternity, is receiving outdoor coverage with Advan.co.uk and marketing agency Everybody Engage, launched to coincide with the production’s October gala opening. 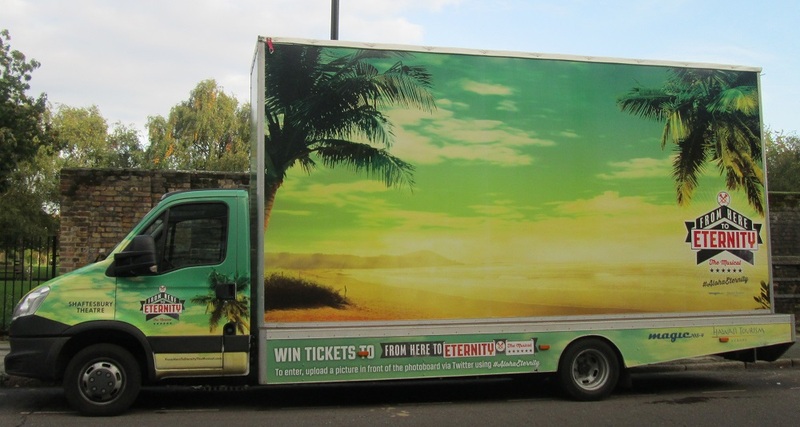 Currently booking until April 2014, the show is housed at the West End’s Shaftesbury theatre and is featured on a mobile Advan, boosted by a social media promotion to win a trip to Hawaii with radio station Magic 105.4 and Hawaii Tourism. Nodding towards the musical’s Hawaiian setting, the Advan presents a sprawling exotic beach backdrop, giving audiences the perfect faux-holiday photo opportunity. The image works along with the Twitter campaign, designed to allow competition entrants to “upload a picture in front of the photoboard” with the hashtag #AlohaEternity. With a creative platform equivalent to that of a 48 sheet billboard, an Advan is the perfect opportunity to attract attention and generate hype in high footfall London areas. The striking artwork effectively encourages social media interaction, inspiring the public to share the image across their own network of friends.